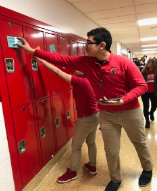 Ms. Hughes’ Freshman classes supported The NJ Coalition Against Human Trafficking’s January 11th Awareness Day with a Locker Slam. 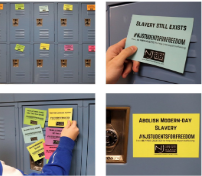 Students spread the word against human trafficking by “slamming” student lockers with magnets provided by the NJCAHT. MRHS is one of 30+ schools across the state to participate in this important day. Students also viewed a live feed event via Facebook that addresses this very serious issue. The program will also be posted to be watched at any time on Facebook@njhumantrafficking and Instagram@njhumantrafficking.